The bath chair has been mentioned pretty much since we brought Caleigh home from the NICU. I've refused the chair on several occasions. Since January and the return of the central line Caleigh's bath time has become a bit of a challenge. I usually lay her flat on the bottom of the tub laying in the water. Caleigh can kick and splash this way. With the central line and Caleigh's rolling movement it's hard to keep her chest dry. We use press and seal to cover her central line dressing, but it's not a fool proof plan. So this time around I actually brought up the idea of a bath chair. I gave in. 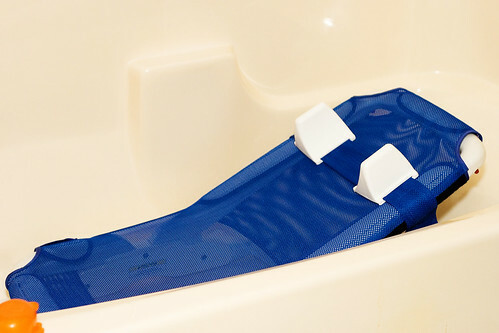 About a month ago I did some research and decided on the Rifton Blue Wave Bath Chair. It was the lowest sitting tub chair that I could find. It also can be adjusted to sit up high and came with a tub base for the future that makes the chair even higher up. So far it is ok. I've had a good routine with bath time so this is just going to take some time to get used to it. Caleigh doesn't seem to mind the change either way. The bath chair brings to mind the larger picture. Caleigh is getting to be a big girl. 30lbs and 36 inches long and still growing. On a good day I might appear to be 5'1' but usually I'm just a plain 5 foot tall. How on earth will I carry and lift Caleigh when she gets to be say.. 60lbs.? It's hard for me to think about it. It's hard to comprehend. Yes there are tracks that you can put in your house. There are bed lifts. Van lifts. There are days spent in a wheelchair, but I haven't given up on Caleigh's ability to move independently. Until that day comes I just don't think I can fully wrap my brain around lifting my big girl forever. When I've had a hard day and my body is tired I have a difficult time thinking about the possibilities. I just continue to pray we don't have too.